place building-waste blocks where they need to be to improve surfing spots OR better still, make places that people can’t surf into places where they can. I can give examples but what do you think? In NSW in the 1930s and 1940s there was a massive building, especially around Sydney, of swimming pools on the coast, they were hewn out of rock on the tidal platforms. 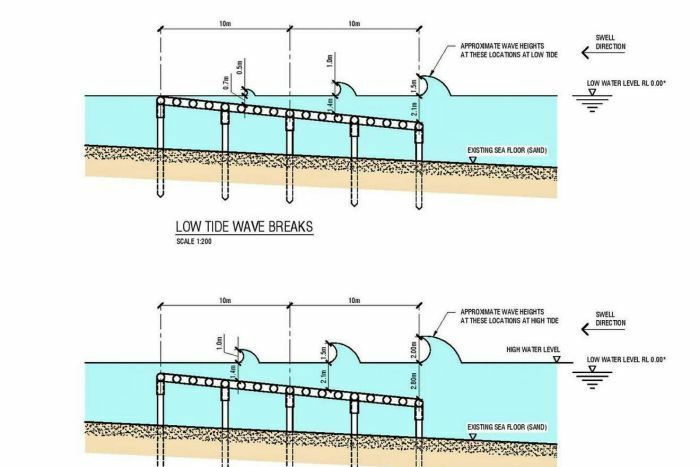 Why don’t we do something similar to make/improve surf breaks? Posted in artificial surf, surf grooming | Comments Off on Why don’t we.. The Gold Coast Council is spending more than $2 million to revamp the offshore artificial reef at Narrowneck using another 70 sandbags the size of a small bus. It is worth looking at this article just to see the specialised boat doing the job. Under headlines of world’s first inflatable artificial reef, a concept has been heralded that uses sand anchors to install an inflatable sail-like structure “the size of a large roundabout” offshore. Troy Bottegal believes that where the ocean meets the submerged sail, the result will be a steady supply of surfer-friendly waves. He is probably right but the Kickstarter project’s funding goal was not reached on November 24, 2014.